Set high in the magnificent Savoie French Alps, dominated by the mighty Mont Blanc, La Plagne is one of the most famous and exciting high-altitude ski areas in the world. One of the first purpose-built resorts in France, La Plagne comprises ten ski centres, each with shops, restaurants, ski schools and children's village, with direct access to the ski area. The villages are well-connected and gondolas and a bus service run between them. Skiing has taken on a new dimension with the introduction of the Vanoise Express cable car combining the two areas of Les Arcs and La Plagne on the Paradiski lift pass. Plagne Villages is one of the older of the high altitude villages and offers excellent ski and snowboarding access. 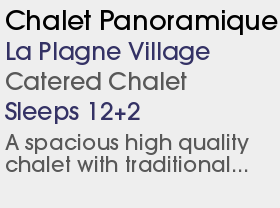 Almost all the ski apartments/chalets in Plagne Villages are genuine ski in ski out. There is an easy blue run down to Plagne Centre and access back to Plagne Villages from either Plagne Centre or Plagne Bellecote is easy for skiers and snowboarders alike. There are a few bars and restaurants nearby but more extensive nightlife in La Plagne Centre which if you don't fancy the walk can be accessed via the pedestrian friendly telebus until after midnight. 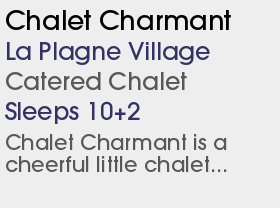 The long, slow Crozats quad chair on the Montchavin side of L’Arpette will be replaced by a smart new six-seater transporting 3,600 people per hour. And new public toilets will be constructed at the top. The Plan Bois beginner area above Montchavin-Les Coches will be improved. The existing draglift will be replaced by a new moving carpet lift and a new draglift roughly 500m long will be built to allow beginners to reach the Lac Noir gondola and Plan Bois chairlift to ride back down. The beginner section will be fitted with more snowmaking. A new 6-seater chair lift, Les Envers, is being constructed out of the valley between Le Fornelet, the low peak above Montalbert, and Plagne Aime 2000, further improving access from Montalbert to the central resort areas. This is more or less in the same place as the Coqs chair, removed some years ago. Presumably the lift co has realised that sending everyone down the tricky blue run to La Roche wasn t such a great idea after all. The runs on the glacier will no longer be groomed, increasing the area s appeal for adventurous skiers (and meaning these slopes can be opened more quickly after a dump). A family fun run will open at the top of the St Jacues blue piste, in the Bellec�te sector. Chauffe Marcel will open slopeside above 1800 sounds a bit like a Folie Douce ( best sound system in the Alps ). A steeper than usual zipline will open, descending from Plagne Aime 2000 to Plagne Centre; special braking system at the bottom it says here! Work will commence on a major development of Plagne Aime 2000, to include a 5-star hotel and an aqua-leisure centre. A 10-person gondola replaced the two old lifts out of Montalbert, out on a limb at the western extremity of the ski area, greatly speeding access to Plagne Centre and the rest of the area.